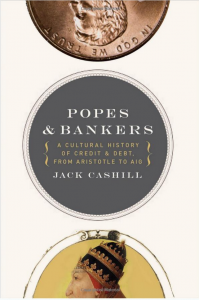 The sub-title to this book is: “A cultural history of credit & debt, from Aristotle to AIG.” I was given this book by a friend and I found it quite interesting. I think everyone ought to read something in this field once in a while. Cashill starts off explaining the laws of usury in the Old Testament and ends commending Dave Ramsey, and that’s quite an overview! The book is filled with interesting anecdotes from the Medici in Italy, the Rothchilds in England, the Morgans in America, and a lot about Jewish/Catholic/Protestant points of view. Cashill opposes paying or charging interest if at all possible, thinking it contributes to the historical downfall plaguing all industrial nations. His only New Testament support for such a point of view is Luke 6:35, “Lend, hoping for nothing again.” He admits that expositors are greatly split over whether that even refers to paying interest. Even Luther would say yes; Calvin, no.